Over 25 yard sales this year! Roncy Rocks is taking place on the same day as RAYS. Roncy Rocks! is returning for its fifth edition in Roncesvalles Village. The community’s annual celebration of local art, music and culture will bring an abundance of great talent with live performances on numerous stages, a large roster of artists in our juried art show and sale, and loads of art related activities for the whole family. Treble Charger is playing at 7pm!!!! Over 25 homes participating in RAYS 2014! Registration ends today at 5pm so register soon in order to get on the map! Map will be posted this evening. RAYS 2014 Charitable Component - Redwood Shelter! For RAYS 2014, we are asking participants to donate 10% of their sales to the Redwood Shelter which provides support to women and their children to live free from domestic abuse by providing safe, accessible services. Please indicate "RMRA yard sale" with your donation for their internal reference. 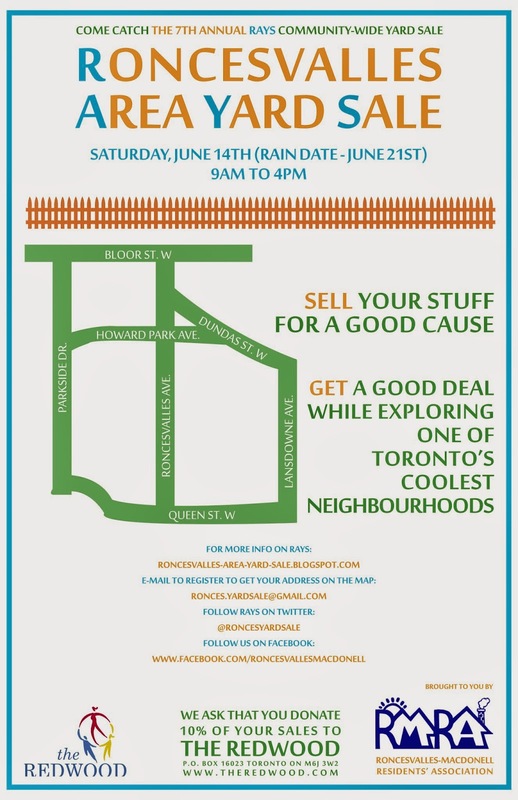 What is the Roncesvalles Area Yard Sale (RAYS)? It is a community event organized in conjunction with the Roncesvalles-Macdonell Residents' Association. Residents in the Roncesvalles Village area are the primary vendors working on their front lawns, driveways and porches selling anything and everything. Collectively they make one giant sale/community-wide event attracting thousands of people to the neighbourhood. What is the date for RAYS? RAYS is taking place on Saturday June 14th, 2014 and runs from approximately 9:00 am to 4:00 pm. The rain date for RAYS is Saturday June 21th, 2014. Cross your fingers we have good weather! Who can participate in RAYS? All residents in the Roncesvalles area (as outlined in the map on the poster to your left/above) can sell their stuff from the comfort of their front yards, lawns or driveways/garages. If you live in this area, you should definitely participate! The success of RAYS depends on community-wide participation! How do I register as a RAYS participant/seller? Please send an email to Chris at ronces.yardsale AT gmail.com with your name and address of your yardsale. Why should I register as a RAYS participant/seller? Because the success of RAYS depends on it! This year, the organizers of RAYS have decided to improve the efficiency of the RAYS experience by providing a map of all RAYS yardsales to people coming to experience RAYS on June 14. This way, people will know EXACTLY where to go and can plan out their routes in order to go to as many yard sales as possible! The Roncesvalles area is a multi-community comprised of three neighbourhoods (i.e., Roncesvalles, Sunnyside and High Park) that are connected by Roncesvalles Avenue east of High Park in the city of Toronto. How do I get to Roncesvalles? 505 (Dundas St. West Car) – Take the 505 going west. Can I set up a table on the sidewalk in front of my apartment building/house? No. Vending on public property such as sidewalks, boulevards and roads is illegal without a permit and you may be ticketed by a Toronto by-law officer. What are some tips for a successful yard sale? Set up early so that you are prepared for those early birds! Price all your items, either individually or in groups (e.g., books 25 cents). Display items on tables or in boxes according to type and/or price. Have a cash box or change apron with lots of coins for change. In the case of large items that can’t be carried away, an impromptu sales receipt can be drawn up with a deposit and an exchange of telephone numbers to hold the item until the traffic has dwindled and you can return with a vehicle to pick up your treasure. Parking is limited at the best of times! We encourage you to walk, ride your bike or take the TTC for best access. If you must drive, kindly park your car and walk in the neighbourhood rather than cruising in your car to reduce congestion/pollution. The amount of pedestrian traffic makes driving dangerous for everyone. Are there any designated “no parking zones”? How can I reduce my environmental impact? Vendors - please place a garbage can by the curb for litter. With the large crowds this event may attract, there can be a large amount of litter produced. At the end of the day, clean up around your property and ensure you don’t leave debris on the street. Shoppers - please hold on to your litter until you see a garbage can and then stash the trash. Will there be a charitable aspect to RAYS 2013? In RAYS 2008 and 2009, we asked sellers to donate 10% of their sales to the Sorauren Park Fieldhouse, a local community rec. centre. In RAYS 2010, the West End Food Co-op (WEFC), a local nonprofit community food co-operative, was chosen. In RAYS 2011, the Redwood Shelter (a local's women's shelter) was selected and in RAYS 2012 the beneficiary was the WEFC. Last year, we asked participants to donate to the High Park Nature Centre (a community-run organization that engages over 8,000 children, youth an adults in the stewardship and restoration of High Park's natural environment. RAYS buyers and sellers - have fun on June 14th! RAYS 2014 is Saturday June 14th!